Once eligibility for vocational rehabilitation (VR) services has been established, additional information must often be obtained to pinpoint the full range, scope and options of services needed to overcome impediments identified at the time of eligibility determination. While the use of existing hearing loss evaluations and audiograms can document the disability to determine eligibility, updated and additional evaluations and assessments may need to be authorized in order to help determine the employment goal and rehabilitation services to be included in the individualized plan for employment (IPE). A comprehensive assessment may be needed to determine the unique strengths, resources, priorities, concerns, abilities, capabilities, interest, and informed choice, including the need for supported employment, of the eligible individual. Again, the VR counselor should remember that rehabilitation technology should be provided at any point indicated in the rehabilitation process. For the consumer who is hard of hearing, effective communication is critical to complete assessments accurately and therefore, hearing aids and other assistive technology should be considered and possibly purchased before these assessment activities are authorized or conducted. Communication Assessment – Initial and ongoing communication observations and assessments must be conducted for the counselor to identify all the communication challenges and problems the consumer faces that need to be addressed and resolved. Specifically employment situations, but also other areas like social and personal functioning, need to be addressed to determine communication and alerting difficulties. It is important to do this throughout the VR process, before and after hearing aids and other assistive listening devices have been provided. The counselor must assess what the consumer’s preferred mode of communication is and how well the consumer understands using this mode. Discussion with the consumer and family members will help indicate where problem areas are, from which the counselor can plan coping strategies, provision of technology and other services to improve communication to its optimum. Some assessment tools are available for these purposes. It is recommended that the VR counselor perform a communication assessment before the comprehensive audiological evaluation in order to identify any issues or questions for the audiologist to address. General Medical Examination – A general appraisal of the consumer’s overall health status to determine if there are any secondary problems that may be interfering with general functioning, or which may be effecting the hearing itself. Also, some medical conditions, such as diabetes are sometimes associated with hearing loss. Otologic Examination – To determine the need for medical treatment and/or the prognosis for future deterioration of hearing. Comprehensive Audiological Evaluation – To determine etiology, level of loss, need for hearing aids, need for speech therapy and/or other aural rehabilitation. The audiologist should also make recommendations for use of assistive listening devices from which the consumer could benefit in conjunction with the hearing aid or independent of it. Ophthalmologic or Optometric Examination – Field of vision testing to rule out Retinitis Pigmentosis and to gain the best possible visual correction for the consumer who is hard of hearing or late deafened and who must rely heavily on visual input for success in communication. Psychological or Mental Health Assessment – Aside from any intelligence or aptitude testing, it is important to determine if any identified problems, i.e. interpersonal problems; constant fatigue; or withdrawal, are psychologically based and need mental health treatment. This assessment should determine what are hearing loss related stresses and what is mental illness. Job Site Assessment – It will be necessary in many cases for the counselor to visit the existing or potential work site to conduct an assessment and make recommendations for needed modifications in furniture arrangement, lighting, work station location, job restructuring, hearing assistive technologies (HAT), co-worker education regarding communication behaviors and use of technology, etc. Since each job site will be different, each one must be assessed independently. Because of individual needs and preferences, it is best for the assessment to be done in partnership with the consumer. Specialty Examinations – If any secondary disability is indicated by the foregoing evaluations, it is important that it be explored by a professional skilled in that discipline in order to fully evaluate the individual’s overall functioning. High blood pressure, for example, can be associated with tinnitus (ringing or other sounds in the ears). Since many of the professionals who perform the foregoing evaluations know little about the communication, psychological or technological application of their discipline to individuals who are hard of hearing or late deafened, it is important that the counselor give the evaluator adequate background information and information on how best to communicate with the consumer. Specific questions should be posed so that the evaluator will target his or her report to the information needed for vocational planning. What type of hearing loss does the consumer have (sensorineural, conductive, mixed)? Is the hearing loss bilateral/unilateral? What was the age of onset of hearing loss? Is the hearing loss progressive, stable, or fluctuating? Are there indications of physiological problems such as tinnitus, vertigo, scarred ear drums? What are (if any) possible treatment procedures for the hearing loss? Is surgery more appropriate than fitting of hearing aids? If so, what is the expected outcome? Are there any employment (or other) situations from a medical perspective that need to be avoided? What is the degree, measurement of hearing loss, pure tone and bone conduction, and average loss in speech range? What are the functional aspects of hearing loss; what sounds will be difficult for the consumer to understand? What environments would be difficult for the consumer in terms of speech discrimination and sound awareness? Are there modifications to the employment environment that would assist the consumer in communication (reasonable accommodations)? What are the possible effects of noisy environments on the consumer’s residual hearing? What is the condition of the consumer’s present hearing aid(s)? Should a different hearing aid be considered? What ALDs would be beneficial for the consumer, especially in the employment environment? How will consumer’s hearing aid(s) interface with ADLs, telecoils, etc.? What is the individual’s speech discrimination ability in noisy and quiet environments, and what is the degree of expected improvement with amplification? The counselor must analyze the various reports and make the connections regarding how they will effectively translate to the needs of the individual consumer who is hard of hearing or late deafened in the employment situation. The vocational rehabilitation (VR) counselor may be the only professional with whom the consumer is associated who understands the nuances and implications of hearing loss as related to medical and assessment reports (or lack thereof), psychological impacts, and social, environmental and employment needs. The most important and unique function of the VR counselor is to compile all of the consumer and assessment information, analyze it as a whole, and determine what specific problems or deficiencies are interfering with the consumer’s ability to get or keep a job. This phase of the planning process is especially important because, by law, VR services can be provided for only those disability related problems that specifically impact on the consumer’s employment or employability. After a comprehensive assessment has been completed and the employment goal has been agreed upon by counselor and consumer, they will jointly determine what services will be needed to overcome or accommodate identified functional limitations in order to obtain or maintain employment. It is important that the counselor be knowledgeable concerning the hearing disability and the myriad of associated potential services, so that a full range of service options and vendors can be presented to the consumer to make informed choices. This necessitates more than simply listing the names of service providers. The counselor must provide information about the consumer’s service and service provider options. For example, for consumers considering postsecondary training options, it is helpful to their decision-making when counselors provide them with information about the types and quality of support services available for students with hearing loss at the programs being considered. Finding available local resources for needed services and vendors qualified to work with consumers who are hard of hearing or late deafened is not always an easy task. The VR counselor and the VR program administrator of deaf and hard of hearing services will need to devote time to developing and educating these resources and vendors. The complex problems faced by individuals who are hard of hearing and late deafened may be identified and met through effective communication and substantial counseling and guidance. On-going counseling and guidance sessions with the VR counselor who has received training about the psychosocial needs of persons who are hard of hearing or late deafened will help consumers learn more about their hearing loss and the resources available to assist them. For example, the trained VR counselor can assist these consumers to identify and overcome negative stigma, social pain, and communication problems caused by the hearing loss. Counseling and guidance and information could also be provided as consumers start using technology such as hearing aids and other assistive listening devices (ALDs) to help them deal with questions, problems, technical issues and ongoing communication problems. The assessment tools that were used to document the functional limitations of the hearing disability often provide clues to areas of focus for counseling and guidance sessions. The VR counselor will want to follow up on noted problems areas to see if technology and other strategies are resolving the communication issues or if other intervention is indicated. The IDA Institute offers helpful tools for counseling sessions between the trained VR counselor and the consumer who is hard of hearing or late deafened. Providing information to the consumer who is hard of hearing or late deafened is an important, integral part of the essential counseling and guidance services. Often, this consumer has not been exposed to other persons with hearing loss or information available. The VR counselor can assist the consumer to increase their knowledge and gain valuable skills by acquainting them to various resources and information. An excellent resource for this activity is the Hearing Loss Association of America journal articles and other related information. It may be best to introduce these materials over several counseling sessions to prevent the consumer from feeling overwhelmed by extensive information and allow them to practice any skills learned. The counselor should also be aware of possible symptoms of grief as related to the hearing loss and how this contributes to the individual’s functioning. Exhibiting symptoms of the various stages of grief can greatly affect their individual and work functioning. It is not unusual for counselors to encounter consumers who experience difficulties with the grieving process as well as coping and adjustment issues related to their hearing loss, especially those who incur adult-onset loss of hearing. Depression, anxiety and anger may present difficulties for these individuals. A person with depression may not be able to sustain paying attention to what people are saying and, therefore, suffer further communication failures. Such a person may not have energy available to effectively deal with the communication problems they experience. They may need to be referred for intensive counseling and therapy with knowledgeable and trained mental health service providers. Low self-esteem is a frequently identified problem among persons who are hard of hearing or late deafened. Assertiveness in asking other people to alter environments or change their behavior to enhance communication effectiveness or be more easily understood involves taking a risk. Persons who are not accustomed to being assertive or who appear to have low self-esteem may benefit from being referred for assertion training or confidence building counseling. This type of training can help consumers who are hard of hearing to overcome the tension and fatigue that interfere with paying attention and which contribute to misunderstanding of what is said. If the consumer does not know other people with hearing disabilities and reports feeling isolated and generally misunderstood, support groups can be extremely helpful. These types of groups have been found to be successful in assisting consumers to learn to cope with communication problems and stresses encountered while in training and on the job. The leaders of these groups are generally knowledgeable and trained to work with persons who are hard of hearing or late deafened. Trained VR counselors may also consider conducting client groups. Samuel Trychin, Ph.D. offers specific training packages for adjusting and coping with hearing loss including relaxation training. Additional resources include those such as the Hearing Loss Association of American (HLAA) and the Association of Late Deafened Adults (ALDA). Some support groups such as HLAA provide excellent materials and monthly magazines. 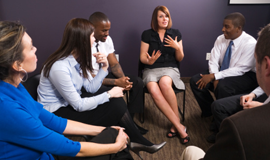 Providing a limited membership subscription to a support group may be an excellent way to educate a consumer and demonstrate the value of support groups. This includes the wide range of services that include individual and group instruction in the care and use of hearing aids, assistive listening devices and other hearing assistive technology, communication skills training, coping skills, speech reading, sign language, as well as instruction in learning strategies for preventing or reducing communication problems. These services are often associated with speech and hearing centers and audiologist group practices. They may also offer sessions for family members. Aural rehabilitation services are beneficial for most consumers who are hard of hearing or late deafened, particularly those with adult onset hearing loss. Aural rehabilitation services can be crucial for the consumer to effectively manage the effects of the hearing loss. When the consumer who is hard of hearing or late deafened applies for VR services, hearing aids are most often requested because this is the only solution they are aware of to address hearing problems. These consumers may think the hearing aid will resolve all of their communication problems and they may not understand the limitations of these instruments. Or, they are reluctant to use hearing aids. 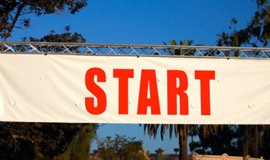 Hearing aids are expensive and are often not covered by medical insurance. Hearing aids have to be routinely repaired and replaced over time. Some hearing aid manufacturers offer extended warranties and some limited hearing aid insurance may be available. However, the complexity and expense of such a purchase can be especially daunting for a consumer who is hard of hearing and new to this technology. It is very important that hearing aids be considered a part of an overall technology package and their use integrated with other hearing assistive technology (HAT) needed for effective communication accommodations. For this reason, the VR counselor will need to be sure any hearing aids recommended can be interfaced with assistive listening devices before purchased. Assessment of the consumer’s communication needs will identify the areas in which technology is needed and can be utilized to improve functioning in areas of major life activities. Hearing Assistive Technology (HAT) can include a variety of ALDs that work independently or in conjunction with a hearing aid, alerting devices, vibrotactile devices, etc. 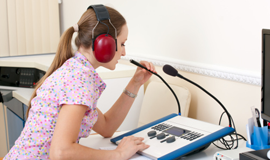 to address employment and other barriers and accommodate the individual with a hearing loss. Consumers who are hard of hearing or late deafened will need appropriate accommodations to effectively complete any training services such as post-secondary training or other job training programs. The VR counselor will need to counsel and advise the consumer about the accommodations available and required for accessibility to these services. For post-secondary settings, the consumer should contact the school’s student access center (SAC) in advance to set up needed accommodations. The VR counselor can work together with SAC staff concerning the individual consumer information and needs.